A Korean student who survived the deadly Aurora Bridge crash has sued two Ride the Ducks companies for their roles in not fixing a potentially defective axle on the amphibious excursion vehicle involved in the wreck. A 21-year-old Korean student who survived the deadly Aurora Bridge crash has sued two Ride the Ducks companies for their roles in not fixing a potentially defective axle on the amphibious excursion vehicle involved in the last month’s wreck. Na Ra Yoon’s lawsuit, filed Monday by the Seattle personal-injury law firm Herrmann Scholbe, is believed to be the first filed over the crash. It names both Ride the Ducks of Seattle and Ride the Ducks International of Atlanta as responsible for injuries Yoon suffered, as well as the vehicle’s still-unidentified driver. Patricia Buchanan, an attorney for Ride the Ducks of Seattle, said Monday the firm is withholding comment while awaiting outcomes of various investigations, including the company’s own internal review. “Until we have those findings, it would be premature for us to discuss pending litigation,” Buchanan said in a statement. A spokeswoman for Ride the Ducks International said via email Monday the company’s policy is “not to comment on legal matters involving the company,” adding the firm would not “discuss any specific details regarding the accident” pending an ongoing National Transportation Safety Board (NTSB) investigation. Also Monday, the city’s transportation director told the Seattle City Council his department is working with the state to assess potential changes to the six-lane Aurora Bridge that could include reducing the number of traffic lanes. “But I think the important thing to note is that any decisions we make around how to improve safety on this bridge need to be driven by the data more broadly versus one horrific event,” said Seattle Department of Transportation Director Scott Kubly. When compared with other bridges in the city, accident data suggest the Aurora Bridge is “not a particularly dangerous stretch of street,” Kubly said. Investigators have said the Duck vehicle that crashed into a charter bus full of North Seattle College students on Sept. 24 had been subject to a service bulletin recommending a repair to its front-axle housing assembly. Ride the Ducks International of Atlanta, which refurbished and sold the vehicle in 2005 to the independently owned Seattle Ducks firm, has said it distributed a safety advisory in 2013 for 57 Duck vehicles operating throughout the nation, including the Duck later involved in the Seattle crash. But Ride the Ducks of Seattle did not make the advised repair, authorities have said. Investigators are trying to determine why that fix wasn’t made. 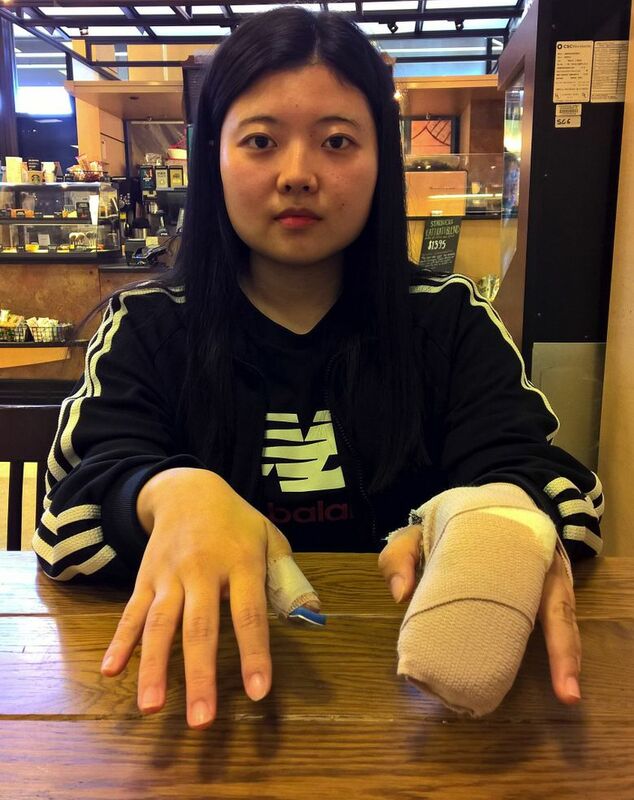 Yoon, who had arrived in Seattle from South Korea eight days before the accident, was among a group of North Seattle College students on a Bellair Charters bus struck by the Duck vehicle that swerved across the bridge’s centerline. Five students died and dozens others were injured from the wreck. Witnesses later described seeing what appeared to be a mechanical problem with the Duck’s left front wheel just before the crash. Investigators later found the left front axle shorn off in the wreckage. Yoon also has suffered emotionally, Scholbe said. In the wake of the accident, at least three separate investigations have been launched. They include a Seattle police accident investigation, a NTSB probe and a Washington Utilities and Transportation Commission (UTC) examination of the Seattle Ducks company. Late last month, the UTC suspended operations for Seattle’s Ride the Ducks pending a full investigation of the company that included inspecting each of the 20 vehicles in its fleet. The UTC, which has alleged in a formal complaint that Ride the Ducks in Seattle operated at least one vehicle in an “unsafe manner,” causing the deadly accident, is expected to issue its preliminary findings of that probe Nov. 3, a spokeswoman said Monday. Once the company’s vehicles have passed safety inspections and are allowed to operate again, Ride the Ducks will no longer include the Aurora Bridge on its tour routes, a lawyer for the company said last week. Since the wreck, concerns over the narrow, six-lane Aurora Bridge have also resurfaced. During Kubly’s presentation to the City Council, he presented statistics showing the Aurora Bridge is relatively safe compared with other Seattle bridges. From 2012 to 2014, 35 collisions occurred on the 0.6-mile span, which accommodates about 70,000 vehicle trips per day. That equates to 0.76 collision per million vehicle miles, Kubly said. By comparison, the rate on the 0.6-mile Ballard Bridge during the same period was 0.93 collision per million vehicle miles, and along a 0.8-mile stretch of Lake City Way Northeast it was 4.09. Most of the 19 oncoming-vehicle collisions on the Aurora Bridge from 2005 through Sept. 23 of this year were relatively minor, involving clipped side-view mirrors, Kubly added. Councilmember Nick Licata urged Kubly to seek more detailed information about the severity of collisions resulting in injuries on one stretch versus another. Despite what the numbers show, the Aurora Bridge can feel unsafe due to the narrowness of its lanes, added Councilmember Bruce Harrell. Potential safety changes being considered include moving the bridge’s pedestrian walkway under the road structure to enable widening of traffic lanes; reducing the bridge from six lanes to five, with one lane reversing directions based on the time of day; and reducing the bridge to four lanes, Kubly said. State and city transportation officials will assess the various possibilities over the next few months, he said. Yoon’s lawyers said Monday they’re still considering whether to also sue the state as a responsible party to the crash due to the bridge. Already, the lawsuit filed Monday describes the span’s lanes as “notoriously narrow,” noting its tight traffic lanes leave “just a mere six inches of room” on either side of an 8-foot, 2.4-inch-wide Duck vehicle. The Herrmann Scholbe firm, which has on its website a primer titled, “Duck Boat Crash Advice to Victims,” in three languages — English, Korean and Chinese — said family members of several other crash victims have been in touch with the firm. Attorneys with several other law firms also have said they’ve been talking to victims or their families about potential lawsuits.